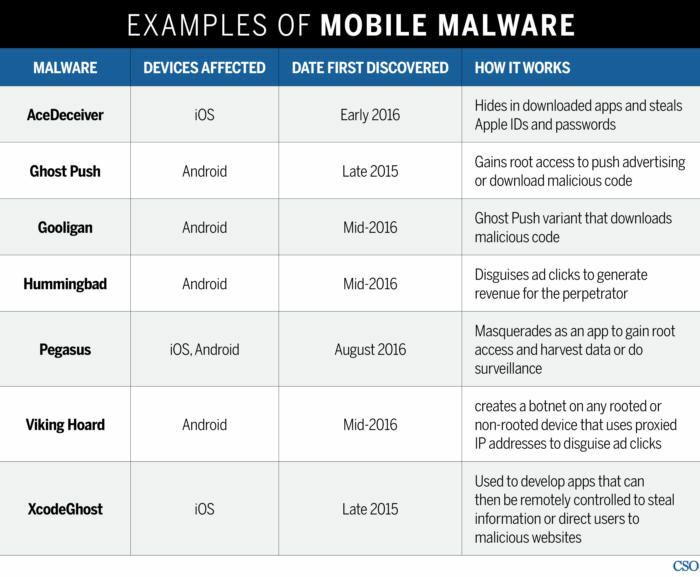 A decade ago, mobile malware was considered a new and unlikely threat. Many mobile device users even considered themselves immune from such threats. Fast forward to 2017, and more than 1.5 million new incidents of mobile malware have been detected by McAfee Labs in the first quarter of the year alone – for a total of more than 16 million mobile malware incidents. Today, mobile devices are coming under increasing attack – and no one is immune. Some 20 percent of companies surveyed by Dimensional Research for Check Point Software said their mobile devices have been breached. A quarter of respondents didn’t even know whether they’ve experienced an attack. Nearly all (94 percent) expected the frequency of mobile attacks to increase, and 79 percent acknowledged that it’s becoming more difficult to secure mobile devices. While Apple and Android have made strides in creating more secure and robust operating systems, malicious actors continue to pump out new and more deceptive malware. What’s more, security is still not a top priority in app design, with some apps allowing users to store or pass credentials in the clear or by using weak encryption. “That’s still going on and it shouldn’t be,” says John Shier, senior security advisor at Sophos. Couple those weaknesses with the ubiquity of mobile devices in the workplace and the proliferation of BYOD policies, and you’ve got the perfect recipe for mobile attacks on the enterprise. Almost half of information workers today are using bring-your-own laptops, 68 percent are using their own smart phones, and 69 percent are bringing their own tablets at work, according to Forrester’s annual security survey. “Obviously, the risks are high, especially when you look at all the corporate data that’s held on these devices, such as customer information, intellectual property, contracts, competitive data and invoices,” not to mention the potential access to corporate networks themselves, says Chris Sherman, Forrester senior analyst. Mobile threat researchers identify five new threats to mobile device security that can impact the business. Employees use their mobile devices in nearly every aspect of their lives with mobile devices never more than arm’s-length away. With such close proximity to corporate network access, voice activation and GPS tracking, state actors are looking at ways to infect mobile devices with spyware. The tactic has proven successful on both iOS and Android devices. Last August’s Pegasus spyware, capable of hacking any iPad or iPhone to harvest data about and conduct surveillance on the victim, was just the beginning. Researchers also uncovered three iOS zero-day vulnerabilities that, when exploited, formed an attack chain that subverted even Apple’s strong security environment. Apple quickly fixed all three Trident iOS vulnerabilities in its 9.3.5 patch. By April 2017, malware authors struck again, this time on a Pegasus spyware version for Android that masquerades as a normal app download, while secretly gaining root access to a device to do broad surveillance on the user over time. Since then, Google has bolstered security measures, including Play Protect security within the Play Store. New malware can quickly turn legions of mobile devices into a botnet that is controlled by hackers without the knowledge of their owners. The first mobile botnet targeting Android devices, dubbed Viking Horde, was revealed just over a year ago. Viking Horde created a botnet on any rooted or non-rooted device that uses proxied IP addresses to disguise ad clicks, generating revenue for the attacker. Since then malware researchers have identified about a dozen more mobile botnets, including Hummingbad, which infected over 10 million Android operating systems in mid-2016. User details were sold and advertisements are tapped on without the user's knowledge and in doing so generates fraudulent advertising revenue. While mobile devices don’t have the bandwidth and computational throughput as a desktop computer, botnet functions don’t require a lot of compute power to pose a threat. What’s more, mobile devices are often on all the time, which gives that botnet owner 24/7 access to large numbers of potential zombie bots. Ad and click fraud in mobile devices is a growing concern, researchers say. “Compromising that mobile device [through ad and click malware] would be a nice way for a criminal to gain access to the internal network of a company, possibly by sending an SMS phish, getting someone to click on a link where they download a malicious app, and then now that they’re on the phone and can control it, they can steal credentials and gain access to the internal network,” Shier says. The scary part, Padon says, is that “they start as adware, but they can just as easily decide to spread spyware to the entire botnet. Then you have 10 million devices that record their owners’ every move. It has a devastating potential with just a click on the app,” he says. Internet of Things (IoT) malware is still in its infancy, but it hasn’t stopped malware authors from making the jump, says Irfan Asrar, senior manager in mobile malware research at McAfee. “The number of [IoT malware] families out there is just 10, and most of them are just variations of the same code base, but we’re starting to see in the underground sites that people are peddling mobile malware kits and are moving into the IoT arena,” and many IoT devices are largely connected to and being configured by smart phones and devices, such as mobile entry into a building or through a checkpoint. Employees need to check the status of their mobile apps regularly, and then update or delete them if they’re no longer supported in Google or Apple stores, Asrar says. Security teams for both operating systems have been quietly removing an undisclosed number apps from their stores at a growing rate, but they haven’t revealed a list of the removed apps or offered any reason for their removal, which can vary from malware issues to copyright infringement to the discovery that the app was leaking data to a third party. The lack of transparency could impact the enterprise because there is more sensitive data at stake by infiltrating enterprise networks, Asrar says. “It’s really hard to protect your entire mobile network because it’s so fragmented,” Padon says. He recommends requiring that security software be installed on every mobile device. “It’s one thing if your Candy Crush app downloads a simple update, but it’s a completely different story if it downloads an update and then launches a malicious activity. This is exactly where Google and Apple lack control,” he adds. User behavior awareness and training should also continue to evolve with the threats, mobile researchers say. “It’s all about reducing risk,” Shier adds, through encryption and visibility into all devices that have access to the network. This story, "Five new threats to your mobile device security" was originally published by CSO.